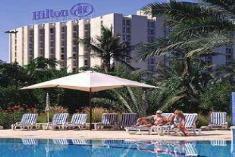 Hilton Abu Hotel Abu Dhabi, Hotel United Arab Emirates. Limited Time Offer! Located south-east, 12Read more minutes by car distance from the city center, this hotel at is the ideal pied-à-terre to take advantage of all the wonders of Abu Dhabi, whether for a few days or for a longer stay.The Hilton Abu Hotel has all the services one would expect of a four star hotel in Abu Dhabi: Restaurant, Room Service, Bar, Tennis Court, Newspapers, Non Smoking Rooms, Television. This establishment is more of a Luxury hotel .Take advantage of the spa & health center which is available at the hotel.This hotel offers a unique service : private beach.You can reach Abu Dhabi in 47 minutes by car (the airport is 15 miles from the hotel).This hotel offers high speed internet.Practical information:This hotel has a valet parking.